What do you have to do in order to be righteous with God? Do you have to die a martyr’s death before God will allow you into paradise? No. Do your good deeds need to outweigh your bad deeds for God to allow you into heaven? No. Do you have to be at peace with nature when you die so that God will absorb you into Heaven? No. What if you have done enough works, will God then allow you into Heaven? No. Man pridefully wants to play a part in his salvation. We invent hurdles to jump, thinking we can earn God’s approval. I don’t want what I’ve earned because according to Romans 6:23, I’ve earned death. I need God’s grace. Every world religion is based on what you have to do to convince God you deserve to go to Heaven… that is, except one – Biblical Christianity. You see, the Bible tells us that God has already done everything for you. Your part is simply to accept Jesus’ gift to you. He did the work, dying on the cross for your sins. Friend, you don’t have to reach for God because He’s already reaching out for you. Please don’t reject Him. 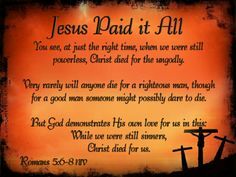 Thank You for dying for me so that I could be forgiven. Thank You for being resurrected so I could have a new life. I ask You to forgive me of all of my sins. Lord, I have done wrong things, and I am sorry. Thank You for Your forgiveness. Please give me the power to live for You all the days of my life. Amen. Congratulations, you just made the best decision you will ever make or recommitted yourself to the greatest cause…the cause of Christ. If you just made that decision, please email me at roblavallee@gmail.com and please let me know. This entry was posted in Salvation and tagged 1 Corinthians 15:3, 2 Corinthians 5:21, Ask Jesus into your Heart, Celebrate Recovery, Christian devotions, daily devotions, Finding Jesus, Rob Lavallee, romans 5:6, Romans 6:23, Scriptural Seeds Ministries on November 4, 2015 by Rob Lavallee.